In this article we’ll discuss some Curb Appeal Boosters for Budget-Minded Homeowners that will be sure to make your home pop. With spring upon us, many homeowners find themselves in the mood to freshen things up. Likewise, if you’re considering putting your home on the market to sell these tips will help you get it sold for top dollar in the least amount of time. If you’re interested in more information on selling your home, please contact us anytime. Homes that are taken care of and show pride of ownership tend to be the gem of the block! It’s important to keep in mind if you’re selling your home that the first photo many buyers will see is the front exterior photo. Buyers looking online through Zillow, Realtor.com and other popular real estate websites will often skip a house they don’t immediately find appealing based on the first photo. With hundreds and sometimes thousands of homes to choose from you’ll want to make sure that your home stands out. With that being said, it’s important to make sure that the exterior of your home is in the best shape it can be in to capture those buyers. Spring Cleaning – The first Curb Appeal Boosters for Budget-Minded Homeowners tip is to take some time to clean up the house and the yard, trim the bushes, mow the grass and add some color with some annual flowers. Once the yard is looking snazzy move on the the exterior of the home. You can rinse down the house with a high pressure hose and nozzle but to get the best results, use a pressure washer and wash the entire exterior including the driveway, walkway and sidewalk. When using a pressure washer, be careful and stay away from areas with silicone, caulking and windows as a high powered pressure washer may cause damage if not used properly. Once the exterior has been all washed down, take some warm water and diluted detergent and wash all your outside windows. When this is all done, you’ll be amazed at how clean and fresh your home will look with just a thorough cleaning. Time to Paint – Roll up your sleeves and head to your favorite DIY store because it’s time to freshen up the accent areas. Painting is a very simple easy project that adds a fresh look to any home. There’s no need to paint the entire exterior of the home, you just want to call attention to the accent areas like the trim, front door, shutters, etc. Paint is cheap and with a little time on the weekend you can accomplish a lot. Front door face lift – Remember, first impressions matter and if you’ve managed to get a buyer to your home you do not want them to walk away because of the way your front entrance looks. If your front door is in dis-repair then you will want to replace it so that it functions properly but if it works fine and just needs a little something to give it some flare then here’s some tips. Many owners choose to paint their front doors an abstract color to make it pop, while I would recommend something neutral if you’re selling your home be mindful to choose a color that matches well with you and your home. Another option to call some attention to your front door area is molding, you can add molding and trim out your door for very inexpensive and it gives the appearance of a much grander entrance area. House Numbers – Consider adding some new numbers for your address. If after painting you don’t want to mess up anything consider these alternatives; you can add the numbers to your mailbox by the sidewalk of your house or use a stencil and paint the numbers on a large square planter and place it next to your front door. Lastly, you might want to get some hanging numbers or a welcoming message and hang them under the trim of your front porch and above your walkway to welcome your visitors and passerby’s. Light Fixtures – Updating or replacing exterior light fixtures can be pricey or inexpensive, it all depends on your taste but replacing the fixtures is a breeze and can add even more to your already fresh look. With all the work that you’ve done outside by now it only makes sense to finish the job. Outdoor sconces can be purchased for around $25 at your local DIY store. Make sure you know what mounting bracket you need before heading to the store to save yourself multiple trips. Mailbox – The last Curb Appeal Boosters for Budget-Minded Homeowners tip is for your mailbox, having done all this work and making your home look beautiful on the outside you surely do not want to keep that old rusty mailbox. Whether it’s attached to your house or mounted by the sidewalk in front of your house just replace it if it’s old and crickety. If however it is operational and functions properly then a quick paint job will freshen it up. After painting, make sure to spray the hinges with WD40 to stop any squeaking and you’re done! 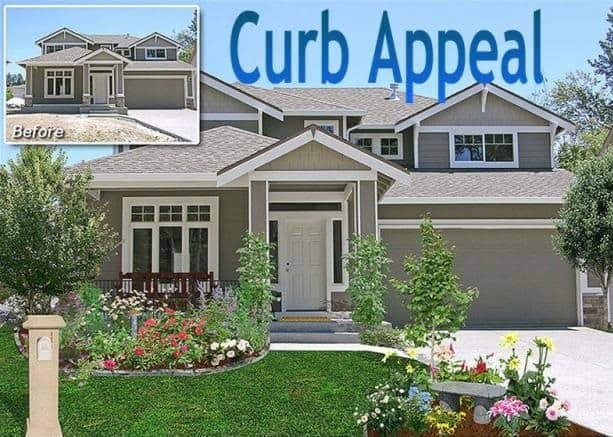 Hopefully this article on Curb Appeal Boosters for Budget-Minded Homeowners helped you gain some insightful ideas. If you have any other questions or would like more money saving tips on how to freshen up your home please contact us. Additionally, feel free to leave a comment below!